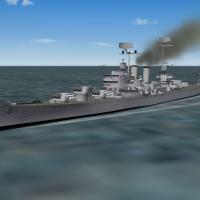 This is a mod of Foxmonter's ARA General Belgrano BACK to it's original USN WW2 version (pretty much!). Data ini edits remove the missile lauchers, but all gun aramament remains intact. The skin has been repainted to remove any post-war markings, and decals created for the hull numbers and ship names. It is as fully SF2NA compliant as we can make it! Guns, sounds, and the hull decals are all included. This version will NOT conflict with any other ships of this type (DAT), as unique identifiers have been used to seperate and differentiate them from each other. As always, fairly easy to follow, yet detailed install instructions are included. PLEASE read them!!! Also, as usual, PLEASE!! give the "Notes" section a read, too.